Shaving blade is adjustable so you can get ice shavings just how you want them. 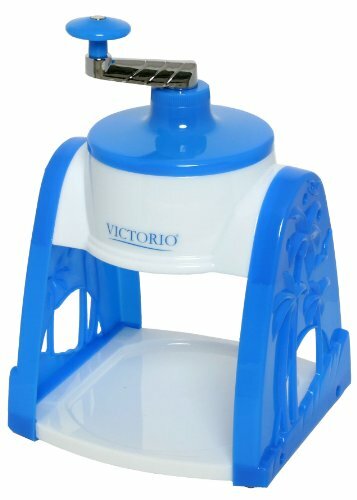 The Victorio hand operated snow cone maker is great for year round snow cone fun. Use for snow cones, slushies, party drinks or anywhere else you would normally use crushed or chipped ice. Comes with 3 ice molds and lids so they are stackable when freezing. Shaving blade is adjustable so you can get make ice shavings just how you like them. Works best when used with ice from included ice molds but you can use regular ice cubes in it as well.